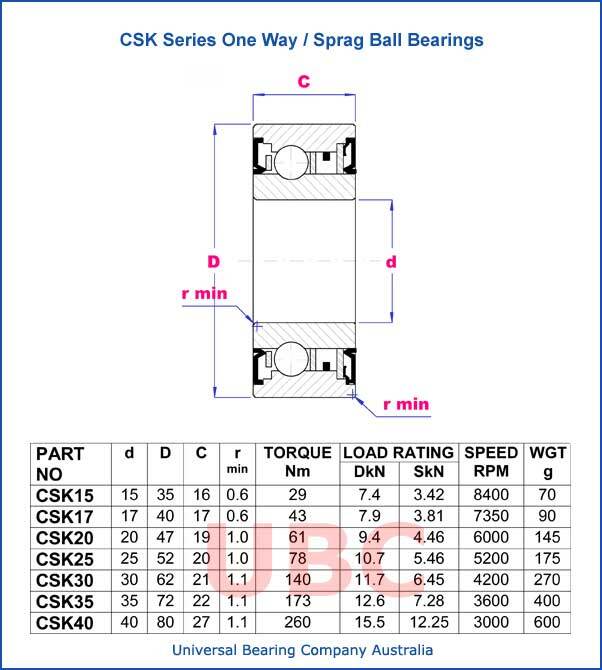 CSK Series One Way - Sprag Ball Bearing The CSK model freewheel is a sprag type clutch integrated into a 6200 series ball bearing (except sizes 8 and 40). It provides you with a one way clutch and eliminates the need for a ball bearing. It gives a high degree of freewheeling accuracy while utilizing a minimum of space. The CSK model freewheels can be used in backstop overrunning or indexing applications. The CSK model freewheels are available with bores to 40mm (1.57) and torque ratings to 384 lb. ft. They are supplied filled with grease and are maintenance free.